Browse our wide selection of the pre-priced carport kits on our web site to make your selection easier and give you a basis to decide if a custom cover is needed for your installation or not. For lean-too covers look at the patio covers selections also (they are designed the same). We custom quote and design any size carport for any installation site. This style is a patio cover attached to a building or home with supporting post on one side. This type of cover works best for one car width. The minimum width should be 12’, the minimum length 18’. The 12’ wide is because you do not want to park to close to the house on one side, and the post can take out the mirrors if you back up hastily on the other side. For covers of this type over 12’ wide the cost can be high do to the heaver materials needed to span over 12’ and maintain a roof load rating. A typical cover would be 12’ x 20’ one 20’ side would attach to the house. 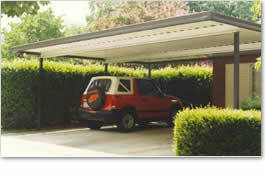 Carports with post on both sides; this type of cover can be free standing, or attached on one side, or end. The minimum one car size is 10’ wide x 18’ deep the minimum two car cover is 18’ x 18’. 9’ x 18’ is the size of a typical car space at the supermarket parking lot. 10’ wide or 12’ wide for a one car cover is better from a daily use stand point. For a two car cover 20’ x 20’ is the ideal size. Choose from aluminum or steel covers. Steel is used mostly commercially. Aluminum is pre-finished, maintenance free and more aesthetically pleasing. You three choices are “W” pan or some times called “V” pan, flat pan style, and insulated. When viewed from the underside the “W” pan has the shape of “W” shape visible, the flat pan and insulated resemble a flat ceiling look. Thus the flat pan or insulated would work as a patio room or screen room cover. The span capability (load carrying ability) of the different styles is governed by the thickness of the material, the depth of the pan. The thickness of the aluminum the roof panel is formed out of, or the thickness of foam in case of the insulated and the density of the foam, effect how many feet between supports you can span and meet a given load requirement. 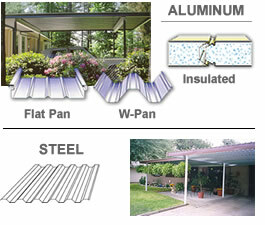 Insulated style carport covers can be price competitive in some situations. It depends on the clear span need and the load requirements. 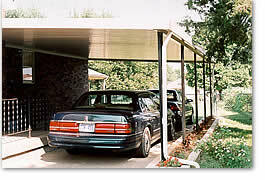 Carport Kit Systems: each manufacture has various component parts that when combined make up a system. The parts are designed to work together to create a good looking cover, that serves as intended and resist the elements. When you tell us the size you need, the style you prefer and the load (snow or wind) you need to carry, we choose the parts needed to make your kit based on the following. That the cover will meet the load requirement when properly installed, that all the parts will fit together, that the cover will look good. We strife for a carport cover kit that is reasonably ease to install, and that has a minimal need for onsite size adjustments, while trying to keep the prices affordable. Standard carport covers over 12’ wide will require beams and post to carry the loads. 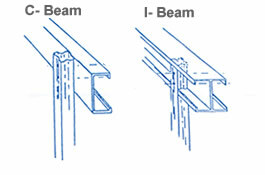 The size of the beam and design of the beam chosen depends on the span and load requirements. A 3.75” “C” beam is fine for a 20’ wide cover in a no-snow load area say 10# load requirement. In a snow load of say 30# we would need a 10” “C” beam. The more load carry capacity needed the beams and post need as well as the larger the beams need to be. Attached covers can have lighter post than free standing covers because the house can act as an anchor on attached covers. Free standing covers need thicker / stronger post from a bending criteria. More posts may be needed in order to meet the load carrying criteria. 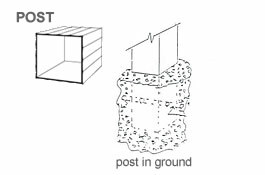 The post on free standing carports need to be embedded in concrete in the ground a minimum of two feet. Permits:if you are in a town where a building permit is needed or desired, please request standard engineering tables from us prior to ordering you carport kit. Your city will tell you what criteria you need to comply with. Your cover design will be governed by their requirements more than your wishes. The city rules will govern the cover’s placement on your property, and if the cover needs to be attached, or free standing, and maybe the size you will be allowed to install.